Danny was 2nd Team All Ohio, 1st Team All Central District & 1st Team All O.C.C-Cardinal. Danny was a 3 year starter on the Offensive line and a Team Captain. He was honored at the banquet with the highest GPA of all in attendance. Danny will attend college in the Fall and study Engineering. 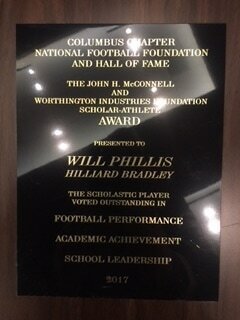 Will was the Division 1 Offensive Player of the Year in Ohio. He earned 1st Team All Ohio, Central District & OCC-Cardinal. He was also named Player of the Year in the Conference. Will was selected as our programs MVP. 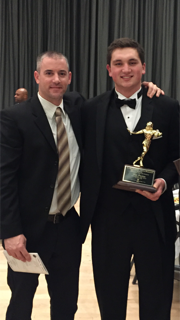 The National Football Foundation panel selected Will as it's Player of the Year and Scholarship recipient. He has received a full scholarship to continue his academic and playing career at Kent State University in Northeast Ohio. Ryan was 1st Team All O.C.C-Cardinal, 2nd Team All Central District, Scholar Athlete & M.V.P. 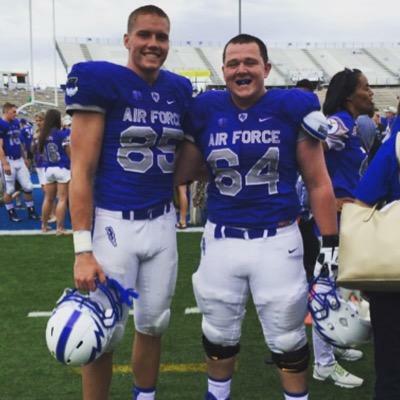 Ryan received a full scholarship to continue his academic and playing career at The United States Air Force Academy in Colorado Springs, Colorado.